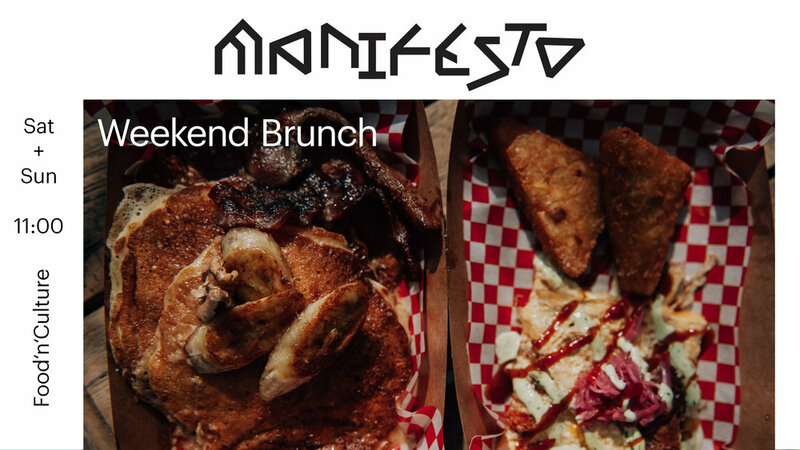 🍳Start your weekend off right with Manifesto’s deliciously epic weekend brunch every Saturday and Sunday with special offers from your favorite vendors! 💐Enjoy the great food, live music, design & flower shops. 🐶And we are dog friendly so your furry friends are welcome! Just keep 'em on a leash. Try the Wake-Up! Burger with chuck roll beef, cheddar, fried egg, BBQ sauce, red chard. Add extras like jalapenos, bacon, mushrooms or chorizo and make it extra delicious! Seasonal pancakes and omelettes plus some of your barbeque favorites, served American brunch style! More details to be announced.